So how does one go about putting this philosophy into practice, and what aspects of loudspeaker design are important in realising this aim? The most critical elements in a loudspeaker are the drive units that convert the electrical signals into sound. They are complex devices which are required to exhibit controlled mechanical behaviour over a wide frequency range. There are a number of potential sources of distortion that must be controlled and, in addition, the radiated sound needs to maintain its integrity over an arc of at least 120 degrees so that the listening area is well covered and so that reflections from room boundaries do not cause unwanted colourations. It is extremely difficult, some would say impossible, to produce a single drive unit that will cover the entire audio band with the performance required for a high-end audio system. 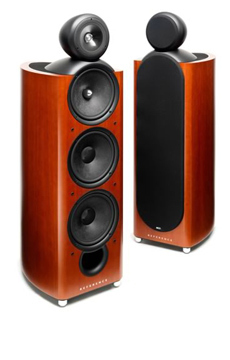 As a result the simplest hi-fi speakers are two-way systems with dedicated bass and treble drivers. The minimum format for a full bandwidth system is the three-way with bass, midrange and treble drivers. The drivers in a multi-way system need to be acoustically integrated by the internal crossover network so that ideally they sound like a single full range driver. Bass and midrange drivers require a specific air volume behind the diaphragm for correct operation, hence the need for an enclosure. In addition, the shape of the enclosure into which the drivers are fitted is also highly important in maintaining a smooth response and controlling the spread of sound into the listening room. The combination of drivers / crossover network / enclosure design is what we term Total System Design, and this is critical in producing a high performance loudspeaker. For Raymond Cooke, the approach to producing better loudspeakers was to apply a high level of rigorous engineering in all the key design areas. The initial priority was to develop new drive units with improved performance, and for these he used the latest in synthetic materials such as Melinex, Polystyrene, Bextrene and Neoprene. Next in importance was the system design – how to combine these drivers with their enclosures and crossover networks in order to create loudspeakers that would push the performance envelope further than had ever been achieved before. The new drivers were implemented into KEF's first product, the three-way K1 Slimline that together with its big brother the K1 Monitor demonstrated that this new company was really serious about innovation. It was not long before the legendary B139 was released with its diaphragm of aluminium-skinned polystyrene, and by 1970 KEF had a range of drive units that were not only used in KEF systems but also in those of a plethora of other manufacturers all round the world. It is a testament to the quality and reliability of these units that they were used so extensively, and certainly they considerably contributed to the reputation and brand image of KEF in the early days. Close connections with the BBC’s research department were maintained, particularly in the area of new materials, and KEF’s exclusive manufacture of the BBC LS5/1A monitor taught the company much about working to tight tolerances.